Voodoo Glass’ latest commissioned Glass Art Piece, was installed last week. This particular piece went in the front entry of the client’s home. 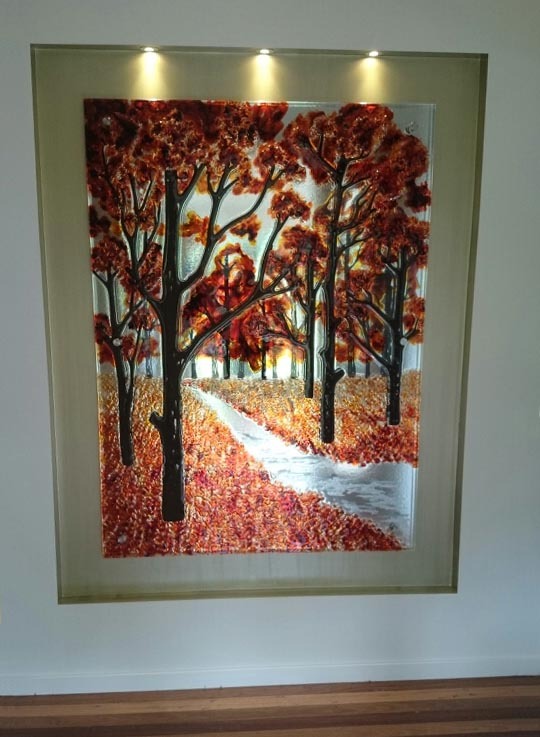 This foyer art piece was slumped and hand painted in rich oranges and browns. Being mounted over a mirror also gives the art piece a three dimensional effect. Trees were also painted on the mirror to give the illusion of tress in the distance. Whether for a foyer, hotel, or front entry piece, art creates a stunning entrance to any commercial or residential property. The “wow factor” element is essential, especially for businesses, as it grabs the public’s attention. Leave a lasting impression, and what better way to create this than with glass. All pieces are custom made in our studio. The possibilities are endless. Come visit us today to discuss commissioning your very own piece of Glass Art.